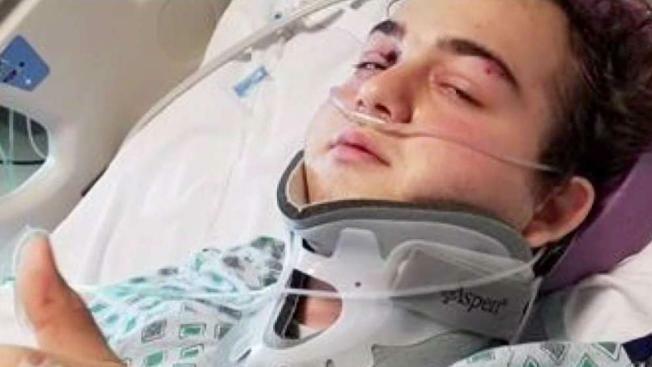 A teen is recovering in the hospital after he was struck by a hit-and-run driver and fell over a bridge in Manassas, Virginia, police say. It was just starting to get dark the night of Friday, Dec. 7 when 18-year-old Ethan McLaurin was out jogging on Lake Jackson Drive. A car hit him in the area of Dumfries Road and the impact was so hard, it flung him over the bridge and onto a rocky embankment below, police said. The pine trees possibly broke his fall and saved his life. Police said the driver of the vehicle that struck him fled the scene. McLaurin's mother, Julia Sugden, said she got worried when she didn't hear from her son for a while so she called him. McLaurin managed to answer his phone and said he was hurt and he didn't know where he was. So, his parents started looking for him. Julia Sugden told him to yell for help and turn on the flashlight on the back of his phone. Larry Sugden, McLaurin's dad, said he heard Ethan's screams when they got to the area and saw the light on his phone. Medics flew McLaurin to a hospital with serious injuries. "He's doing really well with his recovery. He's actually done better than expected in some areas," Larry Sugden said. Julia and Larry Sugden both have a background in medicine. In their experience, getting hit by a car and flung off a bridge is not something patients typically come back from without serious brain injuries. McLaurin has a long road to recovery in front of him and he must endure several surgeries to repair spinal and pelvic injuries. In one family video, Julia Sugden asks her son, "You feeling okay today?" He replies, "No, not really." The Sugdens say they are just happy their son is alive. "We're extremely blessed, to say the least," Julie Sugden said. Prince William County police continue to investigate the hit-and-run and said the vehicle could have damage to the front right side of the hood, headlight or front bumper. The family asked that the driver turn him or herself in so that they could have closure.